A riveting narrative, vintage photographs and period maps showcase Buffalo's proud history and architectural heritage. Author Nancy Blumenstalk Mingus takes readers on an enlightening journey that begins when the area was home to Native American tribes, and ends with recent efforts to revitalize Buffalo's economy. From the Holland Land Purchase and the construction of the Erie Canal, to the Pan-American Exposition and Buffalo in the World War II era, the book provides a revealing glimpse of the people and events that shaped the region. The 160-page book includes more than 70 photographs, illustrations and nostalgic advertisements. An index and bibliography are invaluable features to armchair historians. 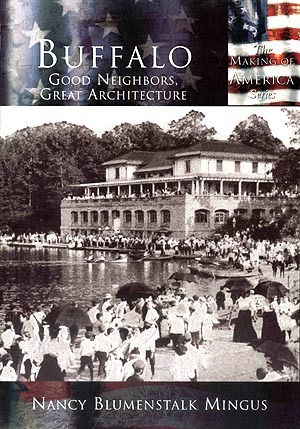 Arcadia Publishing featured the book as part of The Making of America series.